Palm kernel oil, which is extracted from the nut, or kernel, of a species of African palm tree, is commonly referred to as tropical oil. Palm kernel oil is primarily composed of fatty triglycerides, with approximately 80 percent saturated fats and 20 percent unsaturated fats. Palm kernel oil can be found in a number of products, including margarine, vegetable oil and shortening, creamers, chocolate and ice cream. Depending on the amount per serving, palm kernel oil may offer some health benefits. One benefit of palm kernel oil is that it is completely free of cholesterol, which is not the case with animal-based fats like butter. Due to the cholesterol-free nature of vegetable-based oils and margarines, like palm kernel oil, there has been some speculation that these types of oils and fats are healthier than butter. However, this may not be the case. According to the Cleveland Clinic, margarines contain trans-fats that can lead to heart disease. Palm kernel oil also contains vitamin K. Vitamin K is an essential fat-soluble vitamin that is important in bone health and as a coagulation factor in the blood. While you could potentially get 67 percent of your daily recommended allowance of vitamin K in a cup of palm kernel oil, you would be highly advised not to do so. The same serving size would deliver 94 percent of your daily calories, and nearly nine--times the recommended allowance for saturated fats in a single day. This would be one benefit of palm kernel oil that does not outweigh the risks. 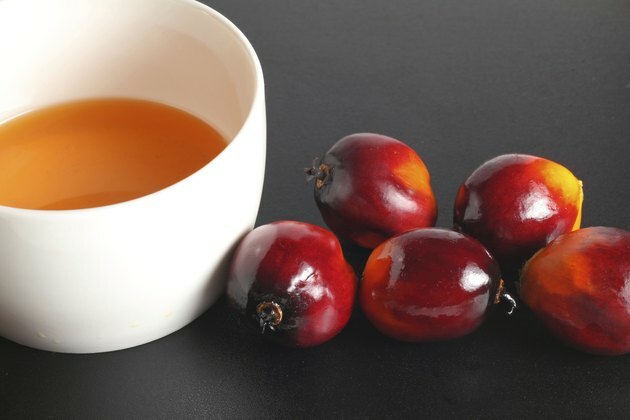 While the overall health benefits of palm kernel oil may not be overwhelming, there are benefits that are touted by the commercial food industry. According to the American Palm Oil Council, palm oil resists oxidation under high cooking temperatures and upon storage, which makes it a better alternative than other vegetable oils for commercially fried products like doughnuts, ramen noodles, potato chips and french fries.